When a customer sees that a company has a certified Quality Management System in place, they are assured of their capabilities to meet industry requirements. For business owners in Sydney, Brisbane, Melbourne, Perth, Adelaide, Canberra, Darwin, Hobart and beyond, having ISO 9001 certification better equips you to run a business with the best possible quality management system. An organisation with an implemented Quality Management System can continuously and consistently improve upon their processes and achieve desired results more frequently. The customer is reassured that they’ll be satisfied with the customer experience and have a positive business encounter. While each company strives to achieve a set of objectives and hit key performance targets, a Quality Management System cannot be overlooked. These guidelines help establish a clear system to monitor the company objectives and to compare them against the industry standard best practices. There are currently three documented versions of the standard; the current edition was published on September 15 2015. ISO 9004:2009 - Management for Sustainability. Used for certification of an organization's Quality Management System. By implementing the system requirements to a specific product category, the ISO 9001 certification standard can be applied quite broadly. The standard provides requirements for certification, however each individual business will need to consider how the standard applies and can be implemented into their specific business type, processes, product and competencies. An ISO 9001 certification with a documented Quality Management System assures interested parties that a company has met the specified statutory requirements. 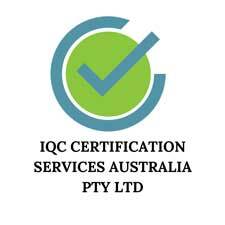 Contact IQC, the leading Australian provider of ISO 9001 certification for quality management, where we have someone in your area, from Brisbane to Sydney to Melbourne.